EACH INDIVIDUAL piece rewards time spent looking, but Vija Celmins’s works should be seen in succession. Her series on particular images—a star-speckled night sky, a spider-web—contain subtle alterations in light, slant, perspective and sharpness. Taken together, these repeated but ever-so-slightly different pictures can feel meditative and revelatory, indicative of one artist’s attention to minute changes in reality. It is possible to see nearly 150 of her works together in “To Fix the Image in Memory”, a new show at the San Francisco Museum of Modern Art (SFMOMA), which will travel to the Met Breuer in New York in September. It is the first retrospective of Ms Celmins’s work in more than 20 years—this particular exhibition has been ten years in the making—and it will probably be many viewers’ introduction to the Latvian-American artist. Now 80, she works slowly, so long hiatuses between her exhibitions are the norm. One critic wrote in the New York Times that she shows “all the haste of a medieval illuminator”. The exhibition contains a variety of media, but focuses mostly on her drawings and paintings. Many of Ms Celmins’s first mature artworks were object still-lifes. As a graduate student at UCLA in 1964, she began a series of oil paintings of ordinary objects that included a hot plate, a desk lamp and a fan. “I thought I would sit down without all my theories and aesthetics,” Ms Celmins recalls in the exhibition catalogue. “I was going to start in a more primitive place with just my eyes and my hand.” The resulting work is more René Magritte than Andy Warhol: the objects are slightly disquieting in their dreaminess, ordinary and yet off-kilter. A portable heater lit orange from within is both beautiful and a little menacing. She often began her drawings and paintings with found images. Early on, she worked from clippings from newspapers and magazines; later she found inspiration in scientific drawings and photographs. “The subject was the photograph,” she once said. “So whatever the photograph told me, I did. I found great freedom in this.” If this makes Ms Celmins sound uncomplicated—as if she merely copies the image—she is not. Through close observation she pulls off an interrogation of the relationship between representation and reality. Her graphite drawings and oil paintings of the ocean’s surface are well represented in the SFMOMA show. She worked from photographs she took from the pier near her studio in Venice Beach, and she has made dozens of artworks from them over the course of her career. Black-and-white, distilled and subdued, blurred in places, they have a photo-real quality that intensifies the longer you look. Looking at this series of not-quite-repetitions, you can see clearly how intensely Ms Celmins grapples with the same image. It is not quite an attempt to get the ocean itself right, but to get the image of the ocean’s surface right. 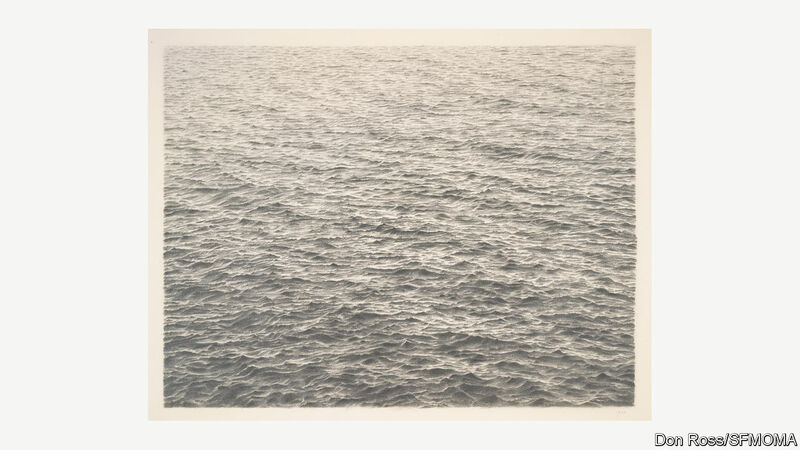 The obsession with surfaces—of ocean, image, drawing—is central to Ms Celmins’s work. It reflects the influence of Magritte, that great painter of windows and illusions; she even made a sculpture of the oversized comb that appears in “Les Valeurs personelles” (1952), one of his most famous paintings. But while Magritte’s illusions were often imagined, sometimes almost hallucinogenic, Ms Celmins draws from the illusory power of photographs, which depict the real world while framing and distorting it. 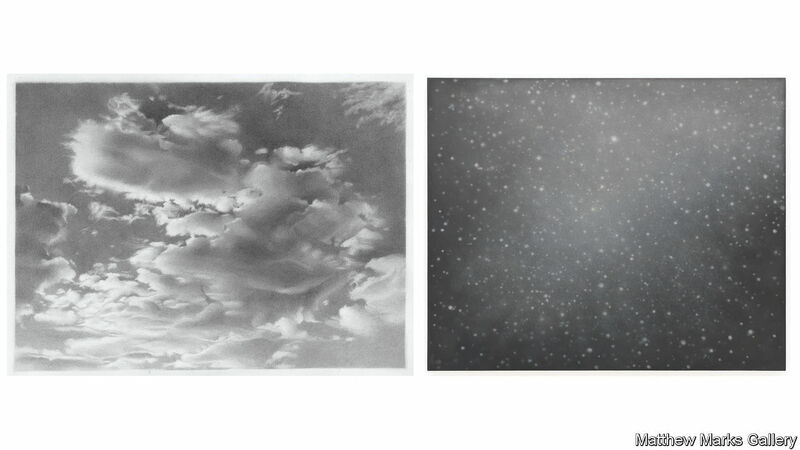 She turned her focus in the early 1980s to the night sky, first using dark graphite. Some pictures are dense with stars, others look almost drained of them, dark with cloud. In the depictions of the sky she made between the mid-1980s and early 2000s, she returned to painting and used larger canvases. Her process became more complex: in some cases, she used more than 20 layers of paint that she sanded off, reworked and painted over again; the stars were outlined and then filled in with liquid rubber, which was then also sanded off. The result is that these expansive works are often simultaneously flat and deep: the stars fade into layers and layers of painted sky. The canvas appears both impossibly dark and also backlit, perhaps by galaxies. Ms Celmins does not offer something new to look at, but a new view of the familiar; her night skies are far from Vincent van Gogh’s. Her work is an antidote to oversaturated image culture, as it rewards careful attention rather than the fleeting kind, and asks the viewer to study versions of the same thing over and over. Her art is, above all, about a particular way of seeing.